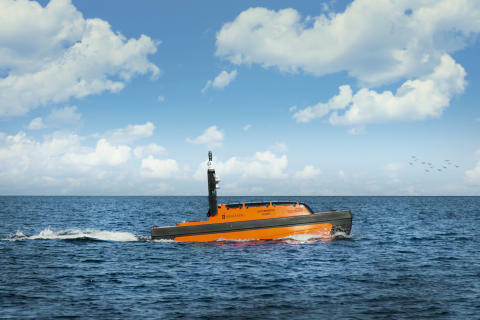 Southampton, UK, 9th April 2019 – Unveiled at Ocean Business this week, Kongsberg Maritime is pleased to report that it has already signed a contract for delivery of a state-of-the-art Sounder USV System, for TASA, the largest fishing company in Peru. Suitably equipped for deployment in fishery applications, KONGSBERG’s new multipurpose USV system will become a crucial resource in TASA’s plans to overhaul and optimise operations throughout its 48-vessel fleet. The fully integrated and calibrated USV solution offers a high definition fishery sonar combined with a wideband echosounder from Simrad, operable from a laptop PC or radio control with data telemetry for remote operations. The Sounder USV provides TASA with an unmanned platform for conducting fish searches and highly-detailed research, and will help the company to meet its goal of becoming a world-leading company in the sphere of sustainable fishery. Following the initial delivery, KONGSBERG and TASA will continue to collaborate in the operation of USVs for fishery applications. Kongsberg Maritime is a global marine technology company providing innovative and reliable ‘Full Picture’ technology solutions for all marine industry sectors including merchant, offshore, cruise, subsea and naval. 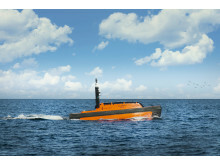 Headquartered in Kongsberg, Norway, Kongsberg Maritime has manufacturing, sales and service facilities in 34 countries. Kongsberg Maritime solutions cover all aspects of marine automation, safety, manoeuvring, navigation, and dynamic positioning as well as energy management, deck handling and propulsion systems, and ship design services. Subsea solutions include single and multibeam echo sounders, sonars, AUV and USV, underwater navigation and communication systems. Training courses at locations globally, LNG solutions, information management, position reference systems and technology for seismic and drilling operations are also part of the company’s diverse technology portfolio. Additionally, Kongsberg Maritime provides services within EIT (Electro, Instrument & Telecom) engineering and system integration, on an EPC (Engineering, Procurement & Construction) basis. Kongsberg Maritime is part of Kongsberg Gruppen (KONGSBERG), an international, knowledge-based group that celebrated 200 years in business during 2014. KONGSBERG supplies high-technology systems and solutions to customers in the oil and gas industry, the merchant marine, and the defence and aerospace industries.